Propane Heaters are a fantastic way to keep your garage useable all year round. They are cleaner than kerosene heaters, and pack more power than electric heaters (our guide to those here). Not requiring a plug socket means they are unbeatable in portability, too. All you need is a place to put it and a propane cylinder to fuel it. Get caught in a power outage? No sweat. They’re also fantastic back-up heaters. One thing to note is that you need some ventilation in your space. Even cracking open a window can be enough. Don’t worry about losing some heat. You’ll have plenty of that. Worried about not having enough ventilation? Make sure you pick up a gas detector, too! 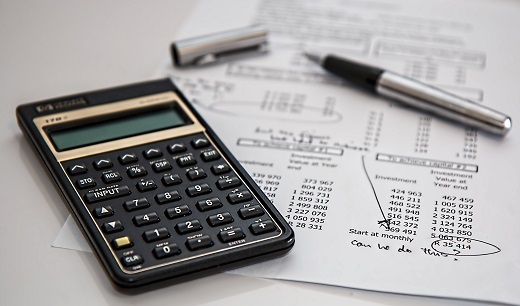 See the top recommended options on Amazon, and brush up on some top tips from FEMA and CENEX. I’ve also written a quick ‘Safety’ section after the reviews. 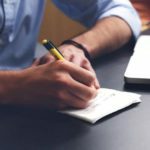 What’s in this article for me? In this guide, I’ll walk you through the types of propane heaters that are excellent for heating your garage. But first, it’s important to understand how we measure the power of these heaters. All propane heaters are measured by BTU’s per hour. 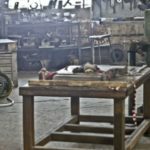 What are BTU’s, and how many will I need? Some quick maths required for best results.. This isn’t how much power it takes to brew a British cup of tea.. When a heater has a rating of 14,000 BTU – that means it can heat 14,000 pounds of water by one degree Fahrenheit, per hour. 1. Take the cubic feet of your space (length x breadth x height). 5. Use our recommendations below to find a matching propane heater! Worried about safety? Check out the ‘Are Propane Heaters Safe?’ section after the reviews! Now without further ado, let’s get on to the propane heaters. The iconic ‘jet engine’ look. These are the propane heaters that are always such great talking points. They look more like they should be strapped to a jet fighter, not used in a garage. One of these will give you a huge amount of direct heat – perfect for heating garages or workshops. Best all-around quality and fantastic looks – our top pick. The greatest thing about these heaters is the wide range of models available. With 5 liquid propane heaters on the market, ranging from 40,000 BTU all the way up to 300,000 BTU, they can suit any size of space. Each includes a 10-foot hose and regulator. The adjustable angle means it’s easy to get the airflow right where you want it. The build quality is also solid. A ‘construction grade’ base keeps dust and debris out, giving the heater a longer lifespan. Safety shut-off switches come as standard, both for tip over and overheating cases. The only downside of these heaters is that the warranty is only 1 year. However, this is standard for heating products. 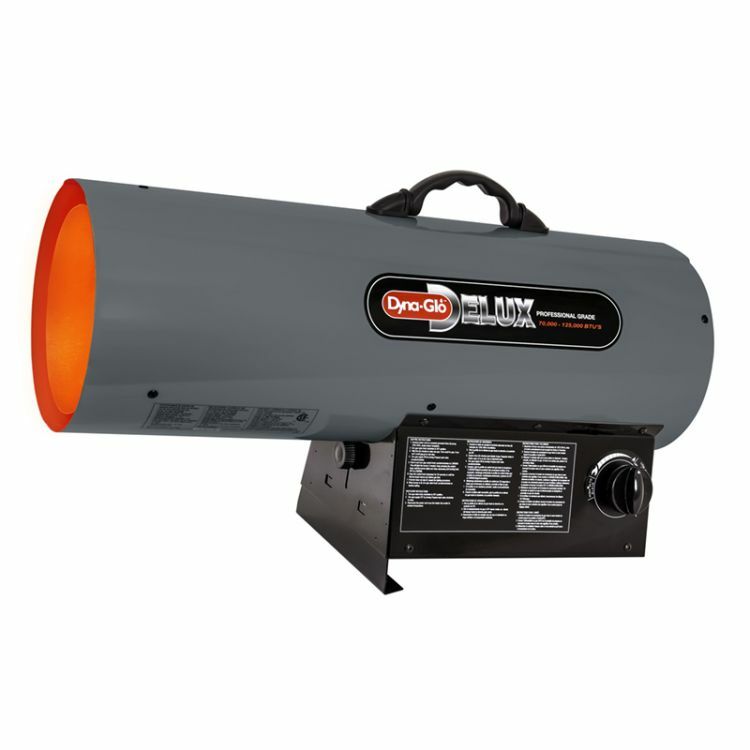 If you’re looking for a forced-air propane heater, these Dyna-Glo models are an ideal option. Check out the full range of Dyna-Glo models on Amazon here. 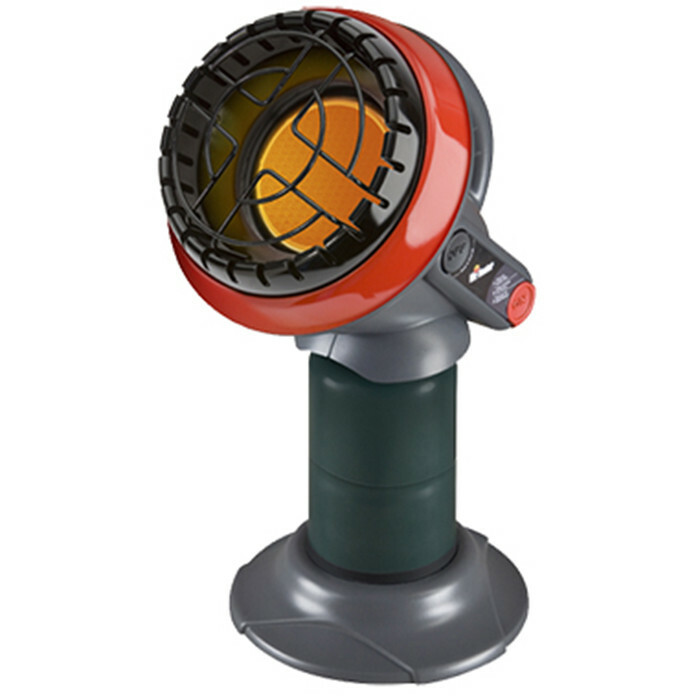 Another excellent choice for forced-air propane heaters are these Mr Heater models. The differences between these models and our first choice is the range of options and the looks. With a jet-black finish and bright decals, these heaters have a much bolder look to them. The same great features are included – 10-foot hose and regulator, variable controls, safety shut-off in-case of overheating, and a warranty that lasts a year. They exhibit everything that’s great about propane heaters. If you prefer the sleek black finish and there’s a BTU option to match your space, these are excellent heaters that are well worth the money. Smaller package, lighter weight, same power.. but a higher price. I was originally going to list just two models, but this Pro-Temp deserves a recommendation too. At the time of writing, it’s price is a fair bit higher than the models above. The higher price rewards you, though. With a heater which is smaller and weighs less than the equivalent models above. Weighing in at just 11.2lbs vs. the Dyna Glo’s 16.8lbs – this heater is much easier to handle and move around. However, we just aren’t sold on the color or extra price. Unless you’ve got a tightly packed garage or find that this one is on sale, it doesn’t quite make our top choice. But it’s still a great option. Check out the Pro-Temp Models on Amazon here. 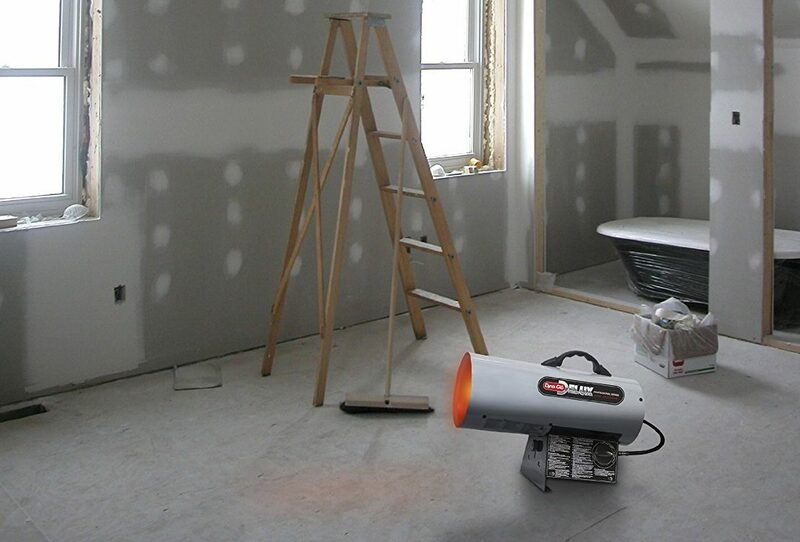 Convection heaters are a great option for heating smaller-sized garages or workshops. They radiate heat in a 360° radius. If you’re able to place them in the center of your space they are fantastic at quickly heating up a room. Their variable temperature gauges also make it easy to control the heat. Something you’ll be thankful for once they really get going! Once again, Dyna-Glo has taken the top spot. They’ve maintained the same level of quality that also put them top for the forced air models. The wide, sturdy base is great for stability – but the safety switches are still there (just in-case it does get tipped over). Check out the full range of Dyna-Glo models at HomeDepot here. Coming in at a close second is the Mr Heater convection heater. These are very similar to the Dyna-Glo models, and are only in second place due to minor differences. If you prefer the look and narrower size of these heaters, they’re still fantastic products. 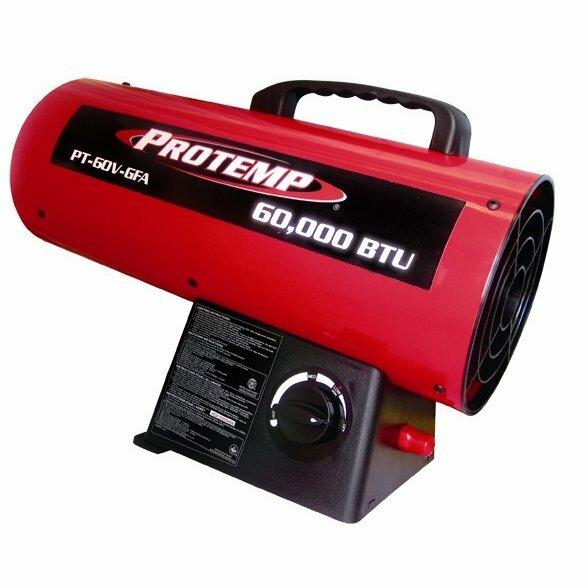 These propane convection heaters have the same great features – a 10ft hose and regulator included as standard, and auto shut-off safety features in the event of tipping over or loss of flame. Our one gripe with this model is that, while the base is still sturdy, it’s narrower than the Dyna-Glo model. This means that the heater is easier to knock over, versus the more stable wider base of our top recommendation above. 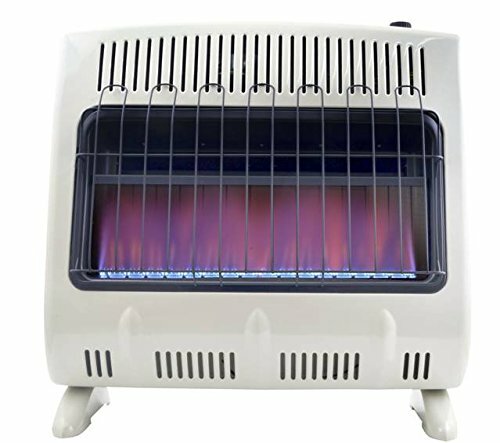 Check out the full range of Mr Heater models on Amazon here. These wall-mounted propane heaters are a fantastic solution if you have a smaller garage. While they aren’t as powerful (typically topping out at a max of 30,000 BTU), they are incredible at saving space while offering all the benefits of a propane heater. 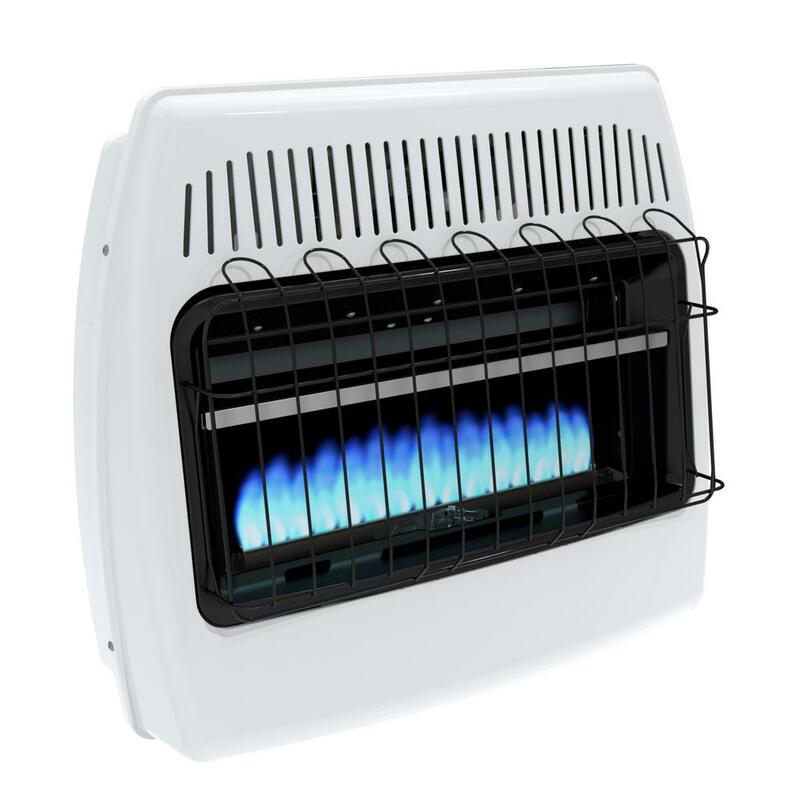 They have all the conveniences of an electric heater – without requiring any external power. They’re also ideal for strategically warming small areas, rather than trying to heat a whole space. As far as wall heaters go, Mr Heater comes out blazing in first place. They offer three models: 10,000, 20,000, and 30,000 BTU. Each of these models have a CSA-certified auto-shut off systems in-case oxygen levels are detected to have dropped too low. They also include the legs and a wall-mounting bracket, as well an easy-to-use thermostat for temperature control. While these models are very similar on paper to the Dyna-Glo equivalents below, the inclusion of a thermostat and better customer satisfaction rating puts these Mr Heater models up to our top spot. Only second based on overall customer reviews. Still a fantastic choice. 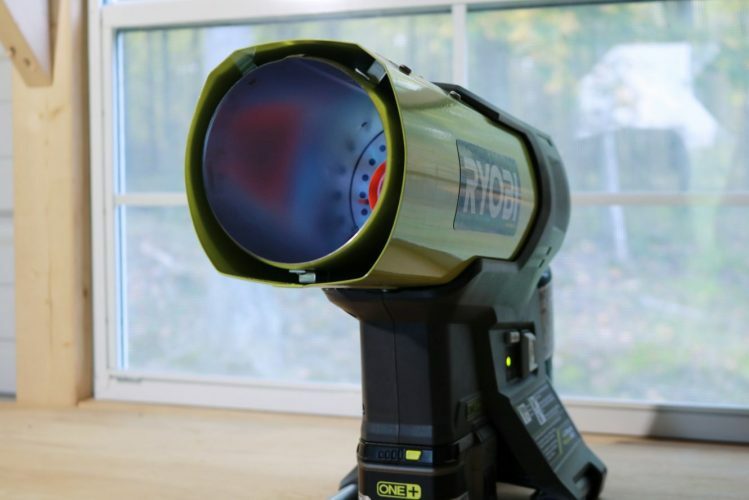 Just like the Mr Heater models, Dyna-Glo also offer three models: with 10,000, 20,000, and 30,000 BTU capacities. Similarly, they also include legs and wall-mount brackets, and CSA-certified oxygen shut-off features. While they don’t include a thermostat, they do have easy-to-use manual controls to help get the perfect temperature. 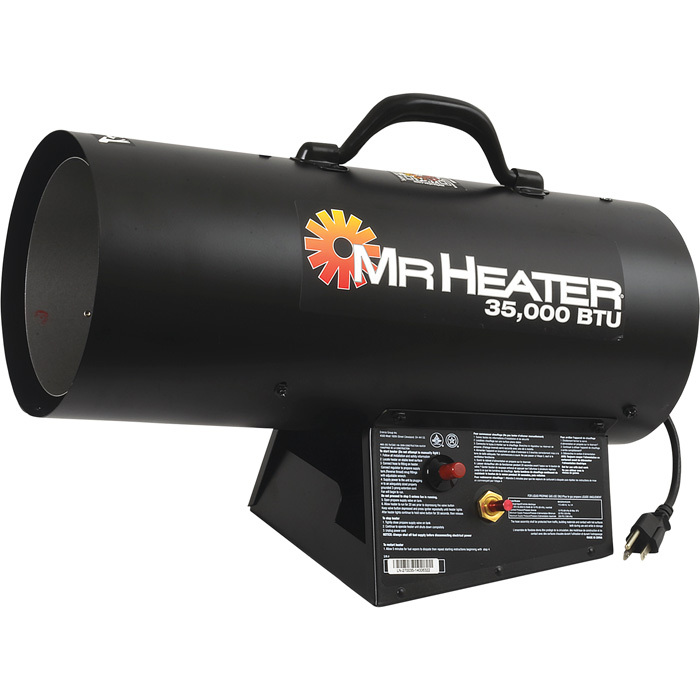 Though the Mr Heater models above do have better reception with customers overall, these Dyna-Glo heaters come in at a close second. If you prefer the whiter look of them to the Mr Heater models, have no hesitation in picking one of these up. The ‘ultimate’ in portable heating. Take this little guy anywhere. It’s not a conventional propane heater, but we had to include this ‘little buddy’ in our top list. 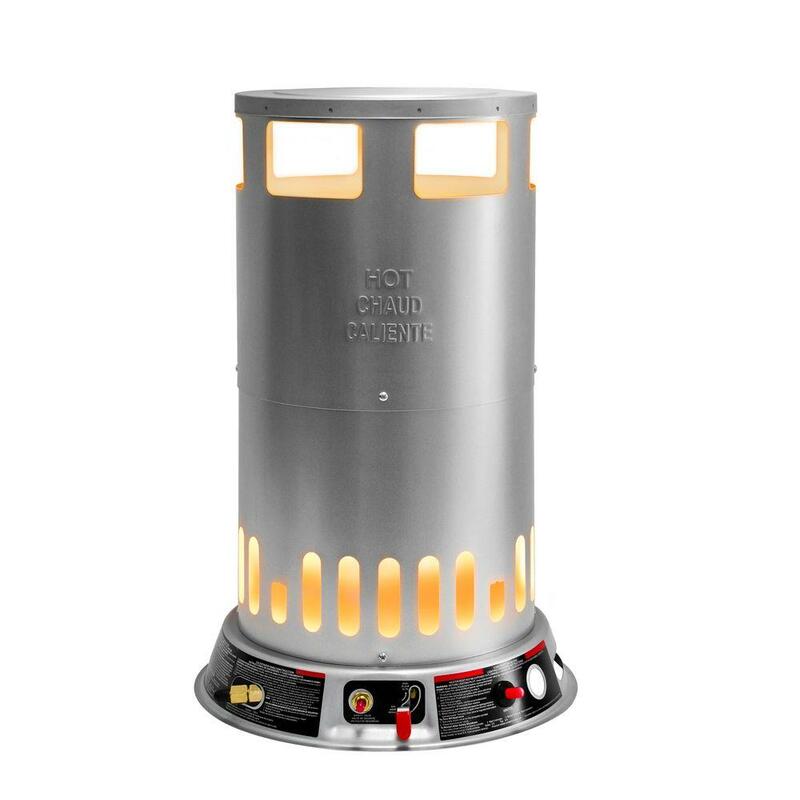 This small ‘countertop’ propane heater can put out an impressive 9,000 BTU worth of heating power. If you don’t need that much, there’s also a lower setting at 4,000 BTU. It won’t heat a full garage, but it’ll keep a small area cosy enough to work or relax in. We like to think of this as a truly portable heater. A fold-down handle, small cylinder, and slide-away fuel connection make it easy to fit in travel baggage. It’s effortless to take this compact heater anywhere. Fishing, hiking, camping, boating, the moon.. we really do mean anywhere! And just because it’s small, doesn’t mean it’s not safe. The oxygen detection and tip-over detection shut off switches are built-in, just like they are in any of the larger propane heaters. Plus, being so small it really doesn’t need much ventilation. This guy even checked it all night in his RV! We think this is a fantastic alternative model for anyone looking to prioritize the portability of their heating. While it shouldn’t be your primary source of heat for a garage, it can be a great extra addition or travel companion. 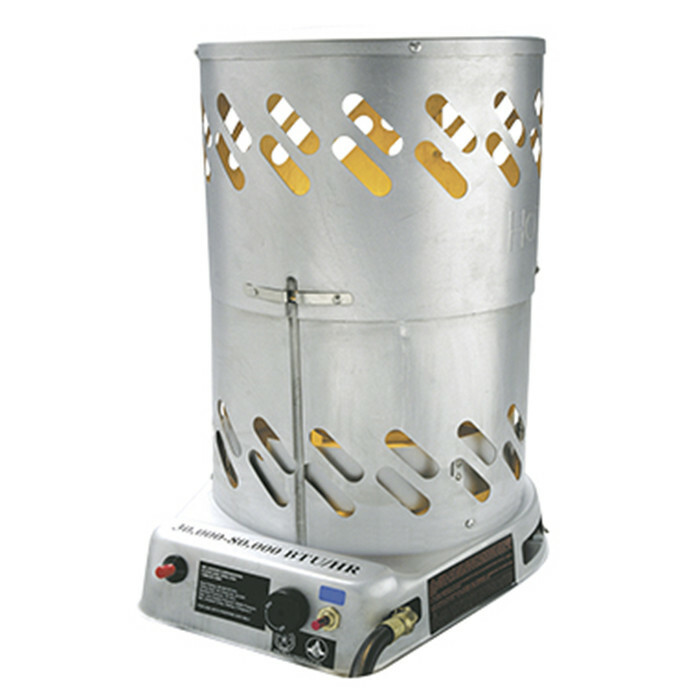 Check out the portable ‘Little Buddy’ propane heater on Amazon. The short answer is yes. The long answer is yes.. as long as you use them correctly! With combustible gas, there obviously comes a few dangers. Massive explosions, your home blowing up… just kidding. The actual flammable element is incredibly well protected, and also extremely easy to detect. The biggest danger with propane heaters is the Carbon Monoxide they produce. This gas can build up so much that it pushes out the oxygen from the air you’re breathing. A situation without oxygen is not one either of us would want to be in! Propane itself has a very strong smell – if something’s leaking, you’ll smell it immediately. Buuut, carbon monoxide doesn’t. It doesn’t smell of anything, and it doesn’t taste of anything. Not so easy to detect. If you’re using a propane heater indoors, please do yourself a favour and pick up a carbon monoxide detector. Even though you only need a little bit of ventilation, these guys can really save the day. Propane garage heaters are a fantastic way to keep your garage heated, without relying on accessing a mains connection. 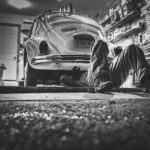 With huge heating capacities and the wow-factor of combustible heat, these can be great heating solutions for your garage or workshop. The fact that you can take them anywhere, even camping, means they have an endless amount of uses. They’re the ultimate in portability, which is so rare to see in an electric-appliance dominated market. Looking for other great appliances for your home? Check out our other related posts for more inspiration – and be sure to check out the other heaters available on Amazon.com, too.